There are times when something works, but isn’t a sustainable realistic solution. One of my favorite questions, which usually gets a good chuckle in therapy, is: So…how’s that workin’for ya? I was at Costco a few weeks ago, when a Good Samaritan passing by let me know that the passenger side rear tire was low. I don’t go around that side of the car really, and so I really appreciated his noticing and telling me. Well, he was being polite. It wasn’t just low, I think it was close to flat. I drove slowly and carefully to the gas station close by, and they filled it up for me. They checked to make sure it had the right pressure. Let me know I should check it frequently over the next while in case it had a slow leak…the other tires had normal pressure when we made sure they were OK. I checked several times over the next few days and it looked OK…for a while. About 5 days later, the pressure had dropped to about a 1/3 of what it should be. Went to another gas station, and filled it up again. Next day…visibly lower. Looked for a gas station…and well, by now you know the drill. I did the predictable. Filled it up with air. Except this was getting to be a bit of a pain. I was starting to drive slowly by gas stations to check to see if they had an air machine. My thoughts while driving, even while listening to the news, or singing tunes, or chatting with the person beside me, frequently went to that passenger side tire. Was it low? When had I last checked? Was I being overly pessimistic and concerned? Was I being overly optimistic and had overlooked the sponginess of the tire?I started circling the car every time I got in. The car was safe to drive, but this was no way to live. The tire was where it should be—it was full and operational—but the strategy I was using was costly. It increased my vigilance, created hassle as I searched for the tire guage and found a pump.It worked but it wasn’t really working. How well was it workin’ for me? Not so much. I took it in to Midas, and the great people there had it fixed in an hour. They found a nail. They patched it. Done. $22. I might have just kept filling the tire with air when it needed it.Would’ve been cheaper financially. Would’ve been more expensive to my mental and physical health—today it’s cold—who wants to be filling tires in this weather! By now, you get that this isn’t really about tires. 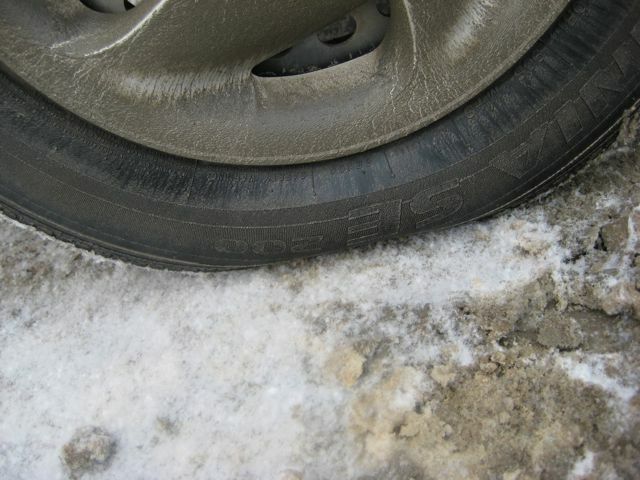 I work with couples who have been filling the air in the tires of their marriage desperately…trying to make the car move forward safely, but at great personal cost. It’s not easy to address a marital flat tire with bandaids, though I’ve heard stories of people trying…and putting in a ton of effort for not-a-lot of results. A wife sees her husband pulling away and is distant.She buys a new negligee, gets a babysitter, and gives him a night he won’t soon forget.He likes it…a lot…but it doesn’t last. …but ultimately leaves them feeling lonely and empty…and back where they started…the tire of life is still flat. are looking for creative and original solutions that don’t provide a temporary reprieve from the problem, but actually remove the issue as something that is creating them distress. To watch a person discover the strategy that is has long term satisfaction is, well, is FUN!! I love my job at those moments. The patch cost $22…the air was free. In the long run, when I measure my quality of life, the patch was immeasurably cheaper. Sure, that solution costs some in dollars if you’re going to see a therapist, but think of the way a person can relax, and er, stop spinning their tires and get moving (sorry, pun was intended! ).